After my project doll house with the kids, recently, hubby and the boy worked on project kids' house. We had some carton boxes left over from our move and things that we bought. 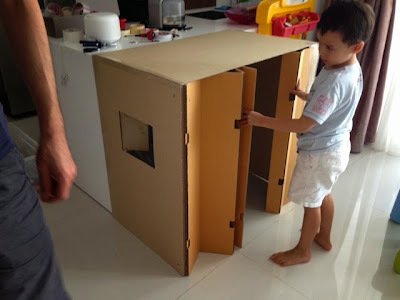 Instead of throwing the boxes away, the hubby has been diligently saving aside pieces that he felt would be useful in making crafts with the children. He has big plans for building houses, boats etc! So last Sunday afternoon, the boy and the husband decided to work on building a little kids' house. They had a rather grand plan to build something that both the boy and the girl could fit into! And so, the work began. 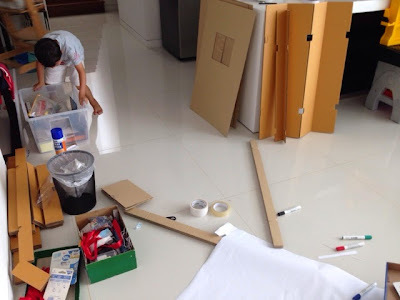 They took out all the necessary tools and a some proper planning was done. They cut out some panels of the carton box for the walls and even had a window built with clear sheets to resemble glass. And after three hours of hard work, the house was finally finished! 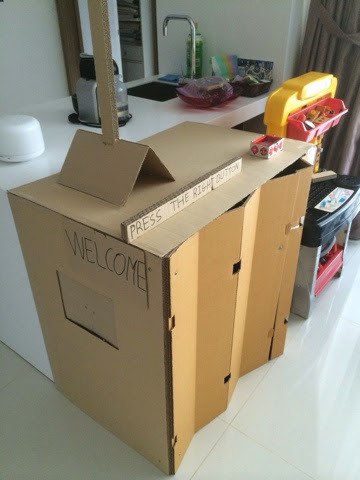 The kids added a door bell using one of the girl's toy which makes music. And they also created a sort of chimney. The kids have been spending lots of time inside the house. They even brought some of their toys to store in the house and created a "store room" just outside of it. I am sure the kids are going to have fun with the house for a few weeks at the least. 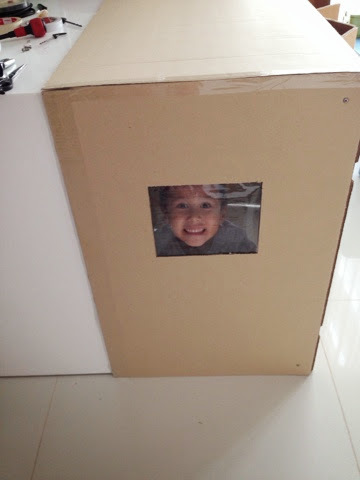 This is a fun project that you can definitely try with some spare carton boxes that you might have.